We’ve always loved to travel. However, we used to only travel once or twice a year on quick holidays. This allowed us to splurge a bit more here and there, occasionally staying in fancy hotels along the way. However, in recent years, circumstances have allowed us to start travelling more. Last year we were on the road for approximately 12 weeks. As amazing as this is, travelling more obviously means spending more money! For us, increased travel means we have to cut corners here and there and try to save money wherever possible. It takes a lot of work to plan a trip, especially when you’re going for weeks at a time on a limited budget. All this planning though, has allowed us to pick up some good tricks along the way! Keep reading to find out some of things we do to save money before and while travelling! AirBNB: In the past couple of years we’ve become HUGE fans of AirBNB! We’ve stayed in some really incredible apartments and houses for relatively cheap. We’ve also had some really fantastic hosts who have made us feel so welcome and at home. We generally try to only rent places that have lots of really good reviews. You can typically find an AirBNB for much less than the cost of a hotel. We typically prefer to live like a local in the cities we visit, and AirBNB allows us to do this much more easily than staying at hotel would! Booking.com: We’ve probably booked more hotels through this site than any other. They usually have some really great deals! Also, once you’ve booked 5 nights through them you become a “genius” member and start getting discounts and other perks at many hotels. Before booking here I usually check the hotel’s website as well as other hotel websites such as Expedia and Agoda to make sure we’re getting the best deal. CouchSurfing.com: Admittedly, we’ve actually never Couchsurfed. However, we know people that swear by it and likely couldn’t afford to travel to the places they do without it. Couchsurfing is super unique and connects travellers and hosts, and allows for people to stay FREE-like the name suggests, on the host’s couch. If sleeping on a stranger’s couch isn’t your jam, the website also allows people to connect in social settings in cities around the world, it’s a great way to get out there and meet fellow travellers as well as locals! The number one thing I can suggest when looking for flights is shop around! Don’t depend on one website when searching. Also, bonus tip- be sure to clear out your cache or search using a private window. Those sneaky flight operators often up their prices when they know you’ve previously searched for a specific flight. Kayak: Kayak has some really cool features. For one, they have a travel map that allows you to search by month or region and find the best prices for flights around the world. This is especially helpful if you know when you’re going but are open to locations and want to see what the best prices for a particular time period. Kayak will also search different sites for the best prices and if you check off “flexible dates”, it will let you know if there are better prices on other days. Skyscanner: Skyscanner offers many similar features as Kayak, including the best price map. We typically go back and forth between both sites as they often find different results. Hopper: Hopper is a super cool app that we frequently use! Hopper will search the best prices based on your search and let you know if prices will likely get better or worse. It will tell you if you’re best off booking now, or waiting. One of our favourite breakfasts included in a stay was in Paris, France at the Dupond-Smith. Frankly, the easiest way to save money while travelling is rent an AirBNB, buy groceries and cook for yourself! However, for us, eating out is one of our favourite parts of travelling. So we’ll typically buy breakfast food, coffee and snacks to have before we head out for the day. We’ll then stash some snacks in our daypack to keep us going. If we’re staying at a hotel, we find it extremely beneficial to book a hotel that provides free breakfast in their rate. Then we’ll fill ourselves up in the morning, often skipping lunch, and then we only need to purchase dinner in the evening. Travel with friends: We’re lucky enough to have another couple that are great friends of ours and love to travel in much the same way as we do. Travelling with others allows you to split so many costs! Often two bedroom apartments aren’t much more than studios/one bedrooms. It also allows you to split other costs such a taxis with other people. Use credit cards to your advantage: If you have a credit card and aren’t getting travel points for your purchases, you’re missing out. We have two credit cards that we use frequently. We try to pay for most everything on these cards to get as many points as possible. All in all we’re guessing we get a few thousand dollars towards our travel per year by always using our cards. Bring your own water bottle: Every penny counts while travelling! Generally outside of North America you have to pay for water at a restaurant. Bring your own water bottle to avoid these charges. 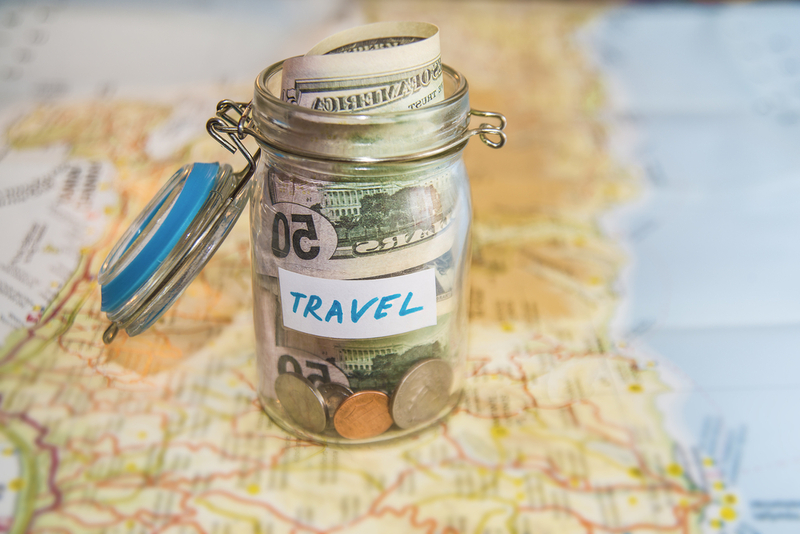 I’m sure you have your own tips and tricks for saving money while travelling! Please comment below with all your ideas! *This post contains affililate links, which means by clicking and booking/purchasing, you help support this blog.